All the beauty and vivid color of natural suede without the impurities and imperfections. 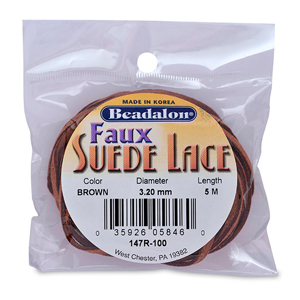 Faux Suede Lace is very strong and consistent in width and thickness. It's also a great alternative for leather cord. 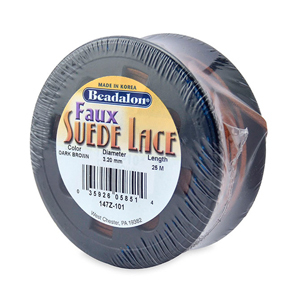 Strong and supple lace is ideal for pony beading, and for creating belts and chokers. 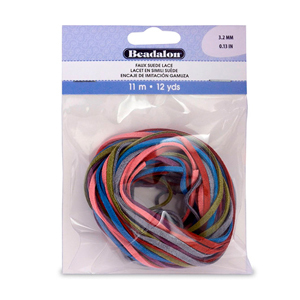 When used with C-Crimp Cord Ends, Faux Suede Lace makes for easy pendants, necklaces, and multi- media designs: just add beads, charms, or pendants, then crimp the ends. 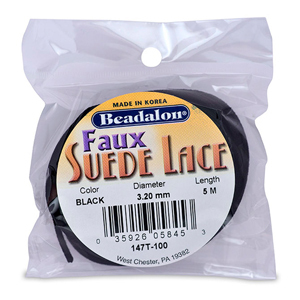 Choose from packages containing assorted colors, black, dark brown and brown cord. Made in the USA by Beadalon. ©2019 Beadalon All rights reserved.